Article Description: This tutorial walks the reader through the creation of a complex Celtic knotwork weave, explaining the design principles, creative process, and finishing details. 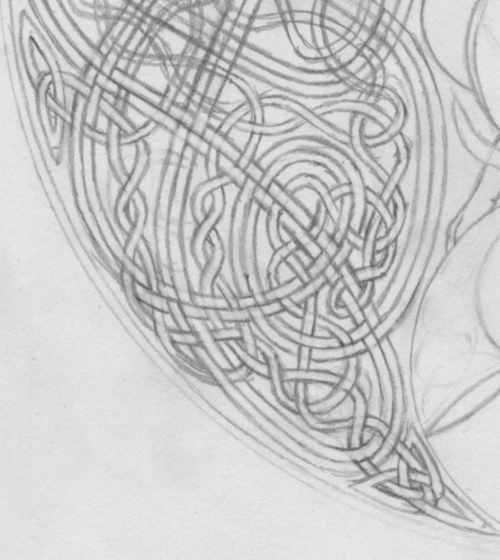 When I start any new Celtic Knotwork piece, the first thing that I think about is theme, and then overall form. 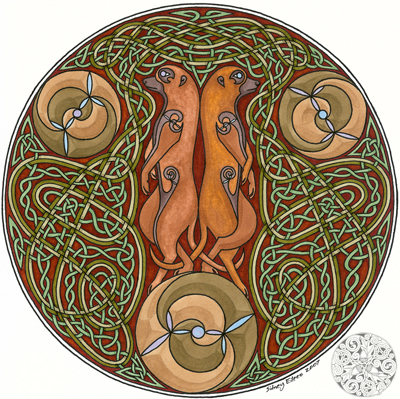 The theme of this piece was set by a club contest, where I was assigned meerkats for my knotwork subject. 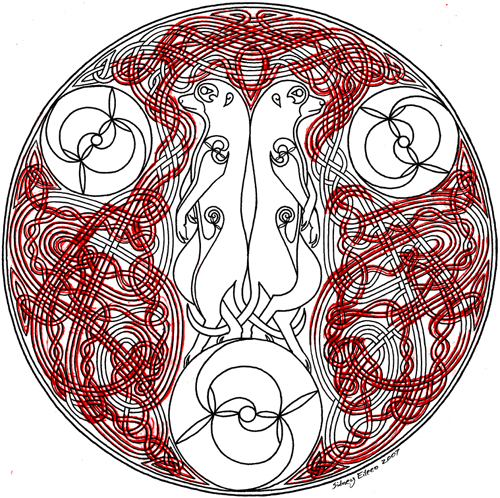 I decided to create a round outer boundary to the design, and placed within it two meerkats and three spirals. 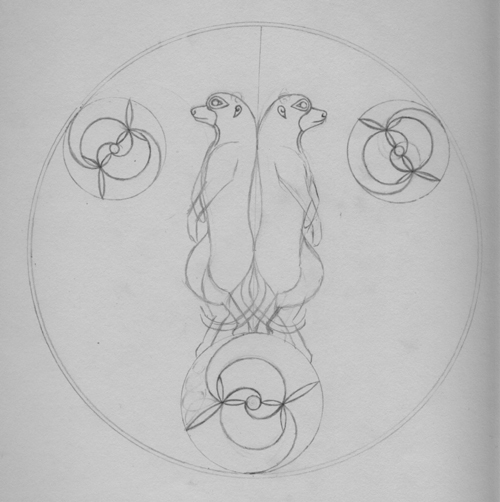 The lower spiral represents the mounds and rocks upon which meerkats will stand and gaze about, while the other two spirals balance the design. 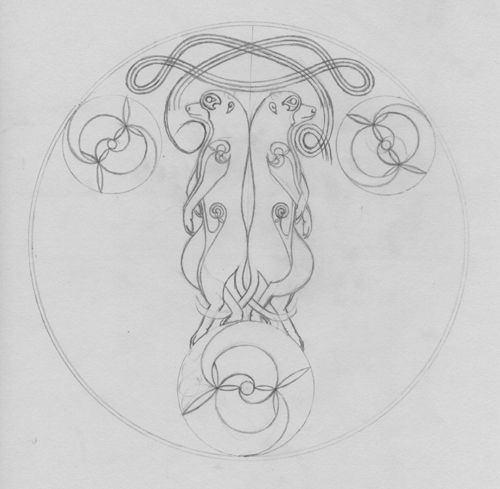 In my way of thinking, there are three primary design purposes for knotwork. It can provide a boundary or embellishment, like on the edge of a painting or surrounding text on a flier. 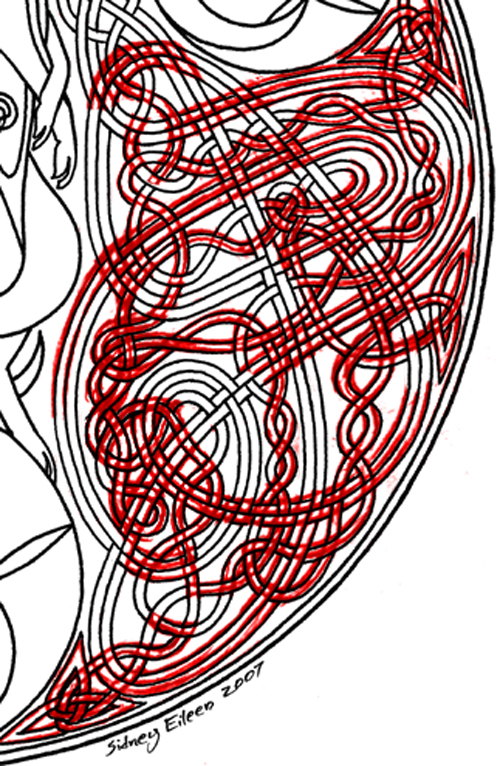 It can define a shape, as when a knot is the form of an animal, plant, or other subject. Third, it can fill space, any space that is available. It is the third use that I will be describing here. * An ideal Celtic Knot will have an even number of crossings. That is, at no point in the weave will a single chord have two overs or two unders in a row. This is what I refer to as the knot having “integrity”. * If a chord is continuous and uncrossed by any other elements, it will always have integrity. * If a chord is continuous and only crossed by other continuous chords that are not crossed by any other elements, it will always have integrity. * If a chord is continuous and crossed by another single element an even number of times (two, four, six, etc. ), then it will PROBABLY have integrity without additional work. * If a chord is open (the ends do not meet), then it MAY OR MAY NOT have integrity without additional work. For Celtic Meerkats, I chose to draw the surrounding knotwork with continuous chords that are not crossed by any other elements. I know this will result in a design that will automatically resolve itself with integrity. There will be no points in the final design where a single chord will have two overs or two unders in a row. No matter how large or intricate the design appears once it is done, this is the simplest kind of knotwork to begin with. 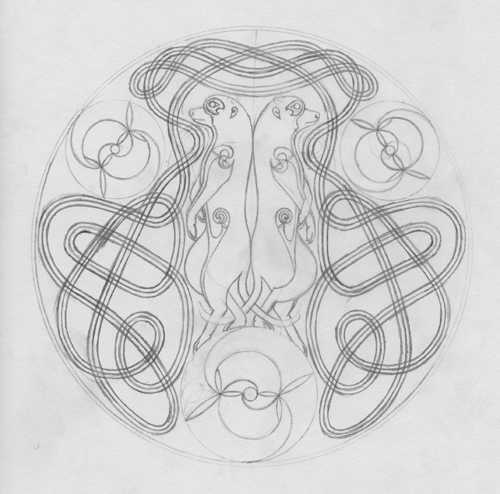 For my own knotwork, I tend to create designs that are rather freeform. I never work from a grid, but I will use the occasional guideline to keep the design even and balanced. 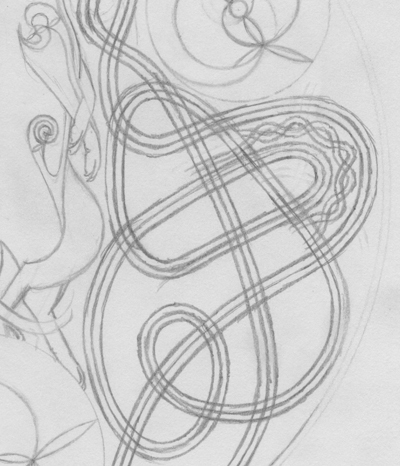 The final shapes of the chords as they change directions should be consistent and fluid, no matter what style of shape you decide to draw your own knotwork in. I usually follow curves that remind me of sine and co-sine curves, or basic curves from fractal art, like the curl of a sea shell. I find that these kinds of curves and transitions are very pleasing to the eye, and easy to follow. They are also very versatile, allowing me to change the direction of a chord with ease. I would strongly suggest that any student of Celtic art take the time to study the curves of the natural world, like sea shells, ferns, and flowers. Take the time to look through fractal art and decide what kinds of curves you find pleasing and why. Look through European art and Celtic art books, with a particular eye to bronse-age jewelry, arms and armor, and stone carvings. 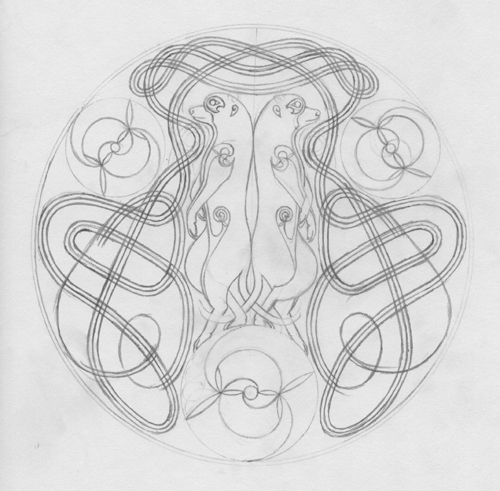 The forms of knotwork vary greatly from place to place and time to time. The Vikings created vastly different knotwork from the Irish medieval illuminated manuscripts, and both vastly differ from the Celtic art found in archaeological sites throughout Europe. 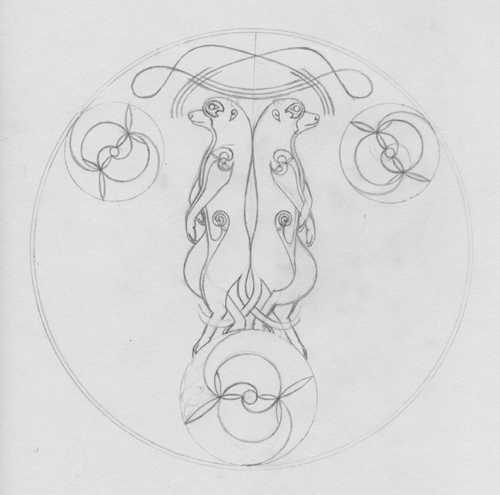 To start the Meerkats, I created the outer boundary and the outlines of the three spirals with a compass. I drew the centerline of the bounding circle with a ruler. The creation of spirals is a subject worthy of it’s own tutorial, so for the purposes of this tutorial, I will simply note that I created them all with the same spiral design, all turning clockwise, titled to balance the overall design with a difinitive bottom and top. I was not completely confident of the shape of meerkats, so I spent some time looking at various photos before placing the stylized meerkats in the design. 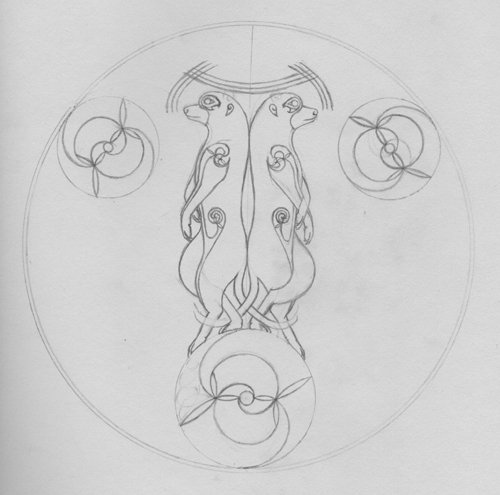 I decided to use two meerkats, back to back along the center line to reinforce the horizontal balance of the design and further solidify the upward direction. 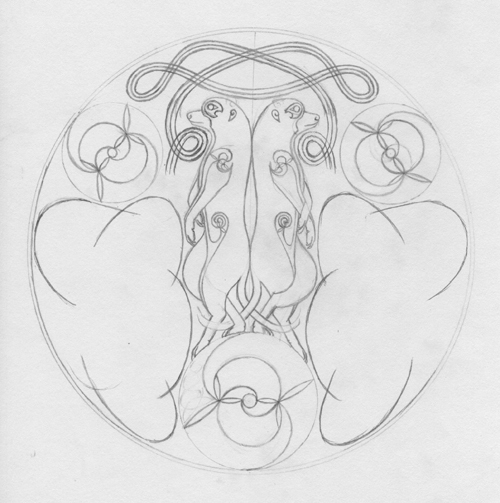 A full discussion of zoomorphs is also a subject worthy of it’s own tutorial, so I will note that I used spiral designs to define the placement of the shoulders, and create definition of the abdominal region. The legs and tails weave over each other. 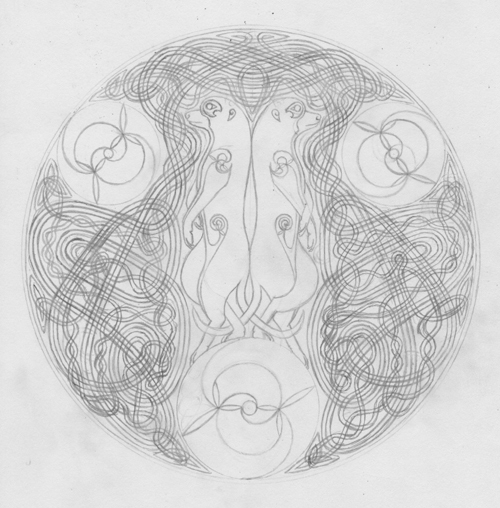 The face and paw shapes are directly inspired by the Book of Kells. After drawing in the focus elements, I was left with a significant amount of space. 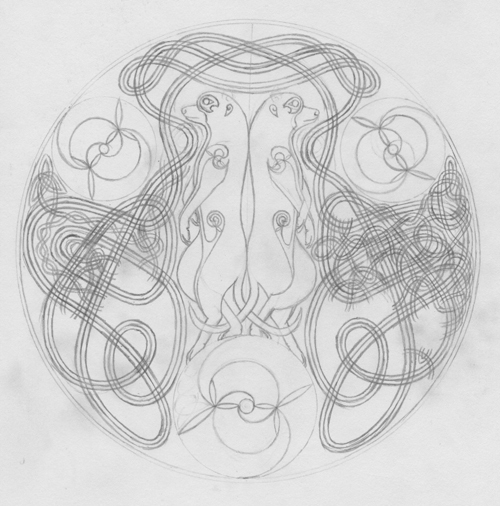 This is what I will fill with Celtic knotwork. I decided to create a double-line for the larger portion of the design, and plan to later weave another chord through the spaces that are left. To balance the large spiral at the bottom, I created a double-line arch over the meerkat’s heads. Crossing that, I drew two more double-lines, ensuring that I will not create a design which is unable to smoothly transition through the most narrow part of the space. I carefully eyeballed the lines so they would mirror each other along the centerline. Next I joined the centerlines of the three parts I had created, forming a balanced weave that will evenly fill the space above the meerkats. I filled in the rest of the two chords, and continued down through the narrow space. At this point I chose to follow the outermost line of the chords because it would come the closest to all bounding edges. I wanted the two-chord part of the weave to have a very sweeping feel to it, and I wanted the transitions to feel very natural in line with the outermost circle. 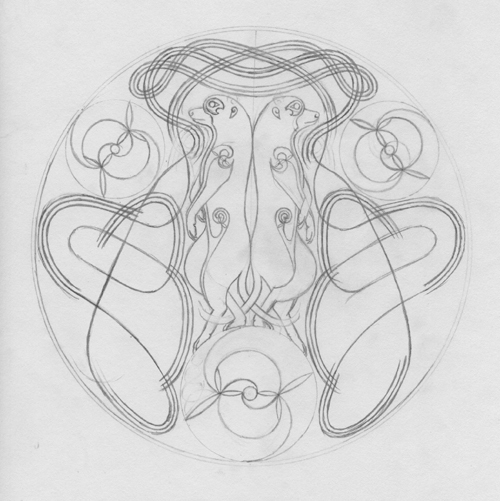 To this end, I drew the broad curves that would lay against each of the bounding lines. By doing this, I knew that the outermost parts of the weave would smoothly cuddle up to the other elements. In order to evenly fill the spaces, I needed to ensure that the chords would not leave any large gaps, so I connected some of the sections by their centerlines in such a way that they formed a rough series of rows. At this point, I can be certain that the space will be filled regardless of where the crosslines fall. At this point, I realized that I was going to be unable to create a closed double-chord because of the loops under the meerkat’s chins. These loops created a section that was too bound for another chord to return through it. In order for a chord to be continuous, what enters an area must leave an area. I had to remove the loop and create a joining line over the meerkats head by which the loose ends could eventually be joined to each other. I finished defining the new two-chord line over the meerkat’s heads, and defined the transitions from top to bottom on both sides. After defining the two-chords for all the joined sections, I joined the last two open ends on each side. I created an extra loop near the meerkat’s feet to fill the space roughly as much as it is for the rest of the design. At this point, the meerkats are technically a complete design, and I could have stopped here. However, I wanted to add another chord element weaving through the two-chord design. I considered extending the meerkat’s tail’s and making them the knot design, but I wanted the final design for this tutorial to be something less difficult than that. Weaving the two tails would have created two open-ended chords, which can require a great deal of modification in order for the final knot to have integrity. Also, I would need to worry that I did not create any extraneous chords which did not belong to either tail. By creating the additional weave out of a seperate, continuous chord element, I could guarantee its integrity, and remove all worry about how many seperate chord elements I created. I started out with two chords weaving around each other through one of the open corridors left by the two-chord design. 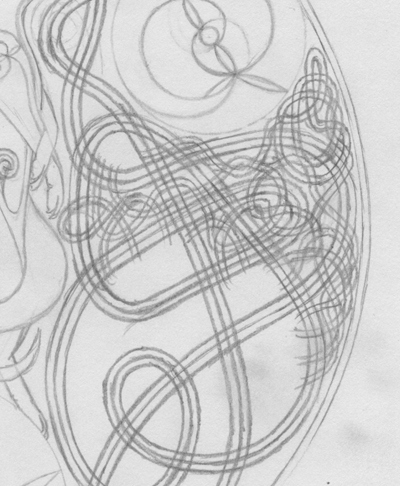 I then took parts of the weave, broke them and drew them across the two-chord design. As before, I tried to keep the chords even and smooth. I continued in this fashion, breaking the simple weave and sending the lines over the two-chord design, but the further I got the more of the original simplicity I lost and the more muddled the overall appearance became. To put it bluntly, I didn’t like how the design was turning out. So, I went to the left side of the design and tried again. After the mess of the first attempt, I decided to keep the crossings to a minimum and retain the simpler motif of two chords weaving over one another. I decided I liked the new design better, erased the first design and completed the weave over the entire piece using the section shown here as my style guide. 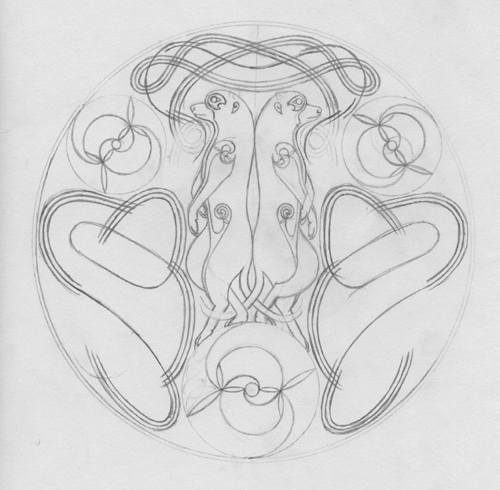 As with the two-chord element, I mirrored the design on the left and right sides of the circle. This is the final design sketch. I tried to keep the simple weave of two lines, and in the corners created by the other elements, I placed triscaleons if possible. I think it bears mentioning that as I created the design, I was continually moving the lines slightly to enhance the curves. It is customary for me to create chord fragments and join them later, so often the curve of the fragments does not match the final joint. These locations must be modified slightly so that the curves are smooth. If you look closely at this final sketch, you will see that there are portions of the chords that still do not have a smooth flow to them. Some of these I will correct when finalizing the weave, and others I will fix on the lightbox. 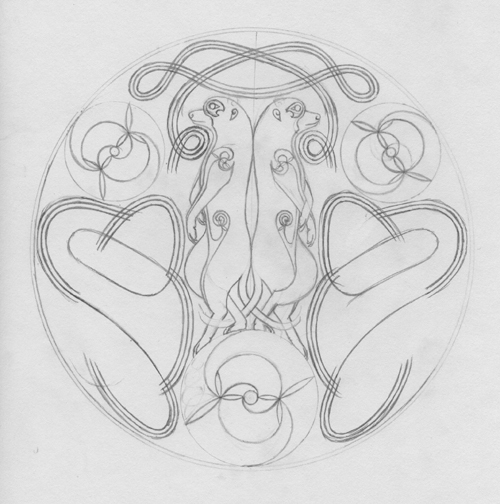 I strongly recommend that until you are completely comfortable with knotwork, you fix all of the curves in pencil before proceeding to inking. This is a small portion of the design with the weave worked in the pencil. In a two-chord weave, the centerline is completely continuous. It has NO BREAKS. Even though these continuous chords are guaranteed to have integrity, it is easy to make mistakes on the lightbox. I strongly recommend erasing the unnecessary lines and resolving the weave in pencil before inking so there is no guesswork once you cannot erase your mistakes. 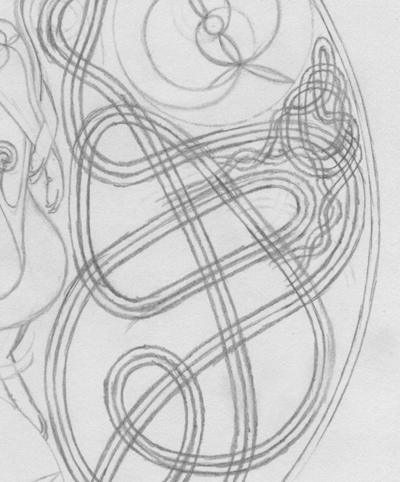 I made one unnecessary crossing line when inking this design, which is visible on the final, inked piece. These illustrations show how most of the lines were moved in the final inking. The red is the final sketch, and the black is the final inking. These on-trend classic granite sinks feature substantially improved properties with cutting-edge workmanship and material properties. Thanks to more than 80% fine quartz sand<a href="https://brivero.com/kitchen-sinks/glass-kitchen-sinks.html">white kitchen sink</a> offers composite granite sinks a 100% pore-free sealed surface, three times harder than natural granite and capable of working under extreme conditions.